A warning notice is seen at the Poipet border gate between Cambodia and Thailand. Nguyen Manh Hung felt like he was posing for a mugshot when he was forced to stand in front of a webcam, covering half of his face with US$700 worth of banknotes, for immigration officers to take a photo of him at a Thailand – Cambodia check point last week. The procedure was applicable to all of the members of the Vietnamese caravan team Hung was leading when they attempted to enter Thailand via Cambodia at the Poipet border gate on April 30, he said in a complaint sent to Tuoi Tre. All of the Vietnamese nationals were asked to prove to immigration officers that they were carrying a sufficient amount of money -- $700 or 20,000 baht -- to get a visa stamped before entering Thailand, according to Hung, chairman of the Saigon Volkswagen Club, a Ho Chi Minh City-based society that gathers lovers of the famed German automobile. “All of us had to hold the notes in front of our faces to be photographed as if we were criminals who had been caught red-handed,” Hung said, adding that the tourists had to provide cash as no bank cards were accepted. At the time the Saigon Volkswagen Club was undergoing what Hung called “an offensive and unacceptable procedure,” another Vietnamese tourist delegation led by a local travel agency was also waiting for their turn. “They were asked to show their money as well,” he said. Vu The Binh, chairman of the Vietnam Society of Travel Agents, said the regulation is unreasonable, as tourists do not necessarily have to carry cash on outbound tours. “They can use bank cards, which are much safer and more convenient, and it is irrational to ask people to prove how much money they have,” he said. 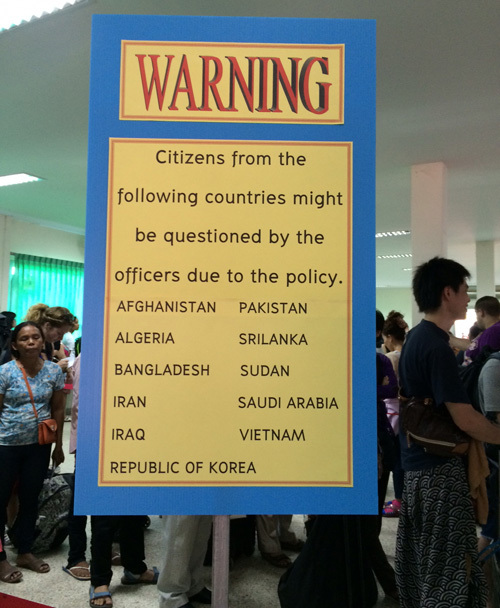 However, there is a large notice at Poipet customs that states that citizens from certain countries “might be questioned by the officers due to the policy,” according to some Vietnamese travel agencies. These countries include Afghanistan, Algeria, Bangladesh, Iran, Iraq, the Republic of Korea, Pakistan, Sri Lanka, Sudan, Saudi Arabia, and Vietnam. Vietnamese tourists who have had to provide proof of funds to enter Thailand via the Poipet border gate said they were told by Thai officers that the regulation is intended to limit the number of Vietnamese entering Thailand following a number of illegal entry cases. Chutathip Chareonlar, director of the HCMC Office of the Tourism Authority of Thailand, confirmed to Tuoi Tre that providing proof of funds is obligatory at the Poipet border gate. It is dictated by the Thailand Immigration Bureau that tourists carry at least $700 or 20,000 baht in cash when they enter Thailand via the Poipet/Aranyaprathet border gate. This is applicable to all foreign tourist visa holders, not only the Vietnamese tourists, she insisted, adding that it is because there is an increasing number of foreigners who use tourist visas to enter Thailand and illegally stay there to work. Chareonlar also denied allegations that Vietnamese tourists are discriminated by the rule, saying checks are tightened only because many Vietnamese passport holders have been found working without permits in Thailand after entering the country using tourist visas. She added immigration officers have the right to take photos of tourists with their money to record the serial numbers of the banknotes, so that the bills will not be used again by other tourists.